Description: Southern Railway GP38-2 5154 had pulled a string of cars out of a metal fabrication company's siding near Long creek. Pulpwood loads were common in this area years ago. Tracks on this line from Gastonia to Hickory are gone now. Date is approximate. 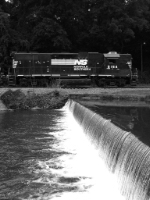 Description: A Southbound NS freight rolls through Slidell. LA - SOU 2530, NS 6645, NS 5154 - Date Approximate. Description: Light power heads south, passing train 12R. Description: Kneeling shot to get rid of my own shadow. Description: H3W scoots southbound with two locomotives and no train. Description: H2W kicks up some snow as they travel northbound on the Buffalo Line after a light snowfall the night before. Description: The H2W heads northbound with a decent sized train and two GP38-2's for power. Description: At CP South Linden the H2W trundles northbound and will be dropping a car for the Lycoming Valley to pick up. Description: The sun comes out at the right time as Washington-bound H74 rounds the sharp curve off the Lehigh River bridge at 10:57AM. 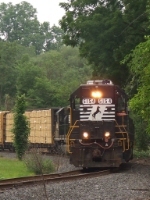 Description: H76 swings onto the Lehigh Line with two high hoods running long hood forward at 11:51AM. 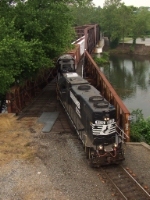 Description: H75 approaches the Schoenersville Road crossing just north of Allen Junction. Description: NS H75 rounds a sharp curve near the Route 512 grade crossing. Check out the dip in the rail near the joint in the foreground. Description: H75 continues timetable-east (although at this location it is actually heading almost due WEST geographically!) through the rain. Description: ...but it wasn't supposed to rain until the mid-afternoon! Grain silos (and some unwanted poles and wires) provide a backdrop as H75 crosses Township Line Road on its way to Stockertown. Quite evident in this photo is the heavy rain, which prompted us to call off the chase here. 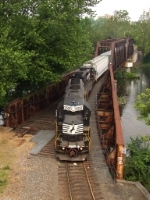 Description: A wider view of the train rolling along the Monocacy Creek. 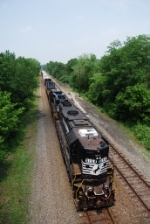 The consist out of Allentown included tank cars bound for Crayola, lumber cars for Stockertown and Uhlers, several cement hoppers (including some old ex-SAL cars) for an industry in Brodhead, and a BNSF 3 Bay for Penn Perlite just north of Bethlehem. 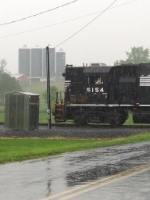 Description: After getting a video of the train at Steuben, the next stop for photos was Bath. H75 is seen here as it comes off the wye at 10:54AM. Description: The train beat me to the next crossing, but I was able to grab a shot of it heading into the long tangent just east of Bath. Description: The final shot of the chase just east of Nazareth at 11:26AM.